We begin developing our gut microbiota when our mom gives birth. Some researchers argue that a small amount of good bacteria is transferred via the placenta during pregnancy. However, our mom mostly helps us stabilize good gut bugs from birth by vaginal delivery, initial skin-to-skin contact, and breastfeeding. This is another reason why good health before and during pregnancy is so important! Our lifestyle can affect our gut bacteria as we age. Our lifestyles have changed dramatically over the past 50 years. Many of these changes have had a negative effect on our gut bacteria. A poor diet, stress, smoking, obsessive hygeine, antibiotics, and other drugs (like oral contraceptives) are a few of the main culprits. Finding the right probiotic isn’t as easy as it should be. There are thousands of probiotic options to choose from, many of them sounding like government alien experiments. Probiotics are named by their genus, species, and strain. Take for example; Bifidobacterium infantis 35624 (see what I mean about alien sounding names?). The Bifidobacterium is the genus, the species is infantis, and the crazy number at the end is the strain designation. 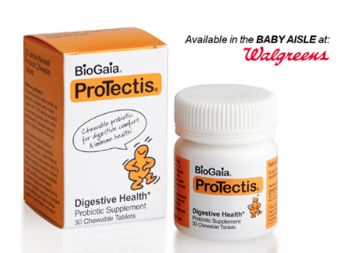 It’s best to find a probiotic that lists all three of these components on the label: genus, species, and strain. Having a better balance of bacteria can also ward off illness like the cold and flu. This Swedish study showed that Lactobacillus reuteri reduced employee sick days by 60%. Another study on the same strain in daycare centers showed a significant decrease in the number of days with fever, clinic visits, child care absences, and antibiotic prescriptions. Balanced gut flora is critical to a healthy immune system – an estimated 70% of our immune system resides in our gut! Bifidobacterium infantis 35624 (B. infantis) has been shown to reduce symptoms of Irritable Bowel Syndrome like bloating, abdominal pain, and straining with bowel movements. In fact, a large analysis study found that B. infantis is the only probiotic that showed any significant benefit for IBS patients. This may be because B. infantis has shown to improve your gut barrier (like a fence to keep out unwanted visitors). Align® is the only brand with this specific B.infantis strain. This is a good probiotic for IBS. 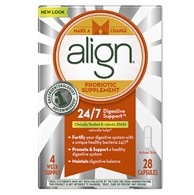 You can purchase Align®here. Lactobacillus rhamnosus GG may reduce GI pain frequency and intensity in kids. Some parents also say that it helps promote bowel regularity. 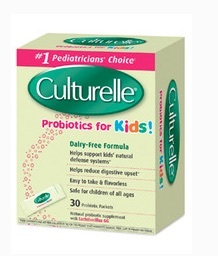 Culturelle® has a kid’s probiotic in powdered form for ages 1 year and older.You can purchase the kids Culturelle® probiotic through my online supplement store (and get a 10% discount!). Don’t let GI problems damper your vacation. Consider taking Saccharomyces boulardii (S. boulardii) a few weeks before your trip to help prevent traveler’s diarrhea. S. boulardii is actually beneficial yeast that has probiotic activity. Already have a case of the runs? S. Boulardii is also helpful for reducing the length of diarrhea from infections. 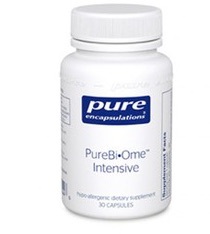 Here is a great probiotic blend that includes 5 billion cells of S. boulardii. This may be a useful probiotic for diarrhea and/or traveling. Constipation is often associated with increased production of methane gas in your colon. Lactobacillus reuteri (DSM 17938) is a specific probiotic strain that has shown excellent results in research. Taking this probiotic can reduce methane production, and promote more regular bowel movements. This same strain has also shown great promise in reducing constipation in children and infants as well. Because of the GI benefit of this strain, this research study even showed reduced colic in babies – nearly 53% less of inconsolable crying with L. reuteri Protectis compared to placebo at one month! 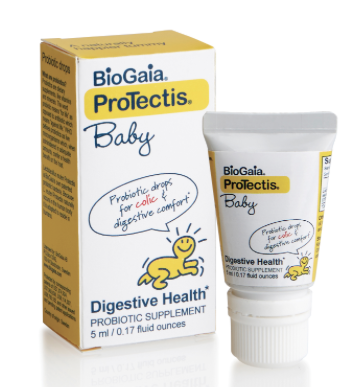 This probiotic for constipation may help bowel regularity in adults, kids, and even infants. Do I need to take probiotics during antibiotic treatment? Well, the short answer is yes. Antibiotics disrupt the normal bugs in your body wiping out both good and bad bacteria. Lactobacillus acidophilus CL 1285 & L Casei (whew that’s a mouthful) are two probiotics that have shown to be effective in preventing and reducing diarrhea caused by antibiotics. 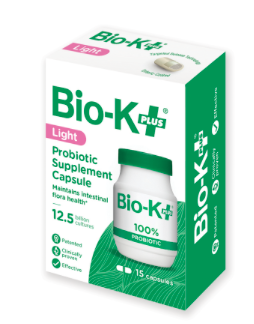 Bio-K+ is a brand with the Lactobacillus probiotic that is sold in health food stores such as Whole Foods and Sprouts. Since antibiotics kill both good and bad bacteria, it is important to take Bio-K+ separate from your antibiotic, about 2-3 hours before or after your antibiotic dose. The company also recommends continuing Bio-K+ for up to 5 days after finishing your antibiotic treatment for best results. This probiotic may be best when you are taking antibiotics. Find a probiotic with multiple strains of bugs (I would recommend 5-10 strains). Since our gut is filled with tons of various kinds of bacteria, it makes sense that for overall health we would want to try and cover more than one of our bases. Each capsule should ideally contain at least 10 to 15 billion CFU (colonizing forming units). This is the measure of bacteria in each capsule. Common dosages for children range from 5 to 10 billion colony-forming units per day. We want to make sure that we are providing enough probiotics to make a noticeable difference. 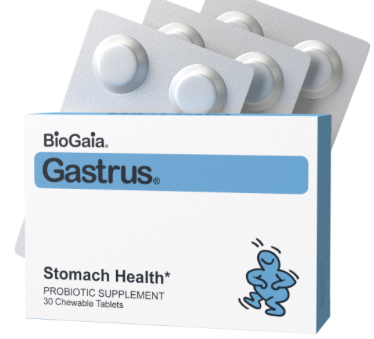 As mentioned above, the label of the probiotic should include the genus, species, and strain of all the good bugs in the product. It is also beneficial to find a probiotic that is “enteric coated”. This means that the probiotics will survive the acidity of your stomach. Since the largest studied probiotics come from the Lactobacillus or Bifidobacterium genera, it would be beneficial to find a probiotic with one of these included. Probiotics are considered a dietary supplement, so they are not regulated by the Federal Drug Administration (FDA). Because of this, Food Farmacist RD primarily utilizes pharmaceutical grade supplements that have been third party assessed for purity. This means that an outside agency confirms that the label is accurately reflecting what is actually in the product. These supplements are great for those of you with food sensitivities or going through the LEAP protocol. Most of these supplements are gluten, dairy, soy, and peanut free. You can get a 10% discount on all supplements by ordering through my Full Script Account . After setting up a free account, search my online catalog for probiotics that I recommend. Include prebiotic rich foods into your diet. Prebiotics are non-digestible food components that stimulate growth of beneficial bacteria in your gut. Basically, these ingredients act like nutritious food for healthy gut bugs! Foods naturally high in prebiotics include artichokes, garlic, onions, chicory root, asparagus, green peas, watermelon, grapefruit, nectarines, and cashews. *Of note, some people with irritable bowel syndrome may not tolerate prebiotic foods if you have not completed a healing gut protocol. Fiber promotes regular bowel movements, and promotes the growth of good bacteria. Only taking a probiotic will not beat out a poor diet. So, make sure to include at least 5 servings of fruits and vegetables per day. The more colorful, the better. Some of the highest fiber containing foods include raspberries, beans, sweet potatoes, pears, and avocados. Some of you may be thinking: “But I do all of that already.” Many times, even a healthy diet with fiber and probiotics isn’t enough. 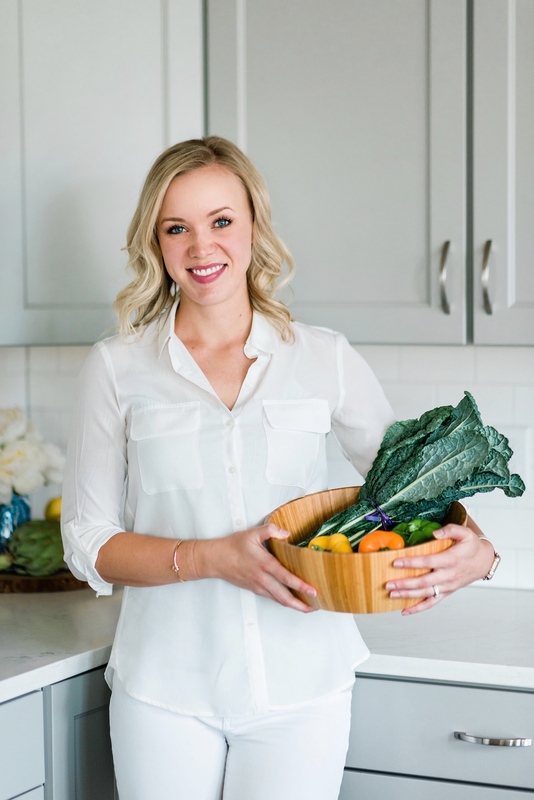 If you find that you are still struggling with symptoms (these may be GI related, or even non-GI related, like migraines or skin issues), then you may be suffering from food sensitivities. Food sensitivities can wreak havoc in your intestine, causing inflammation that may lead to symptoms in various areas of your body. To find out more about whether food is worsening your symptoms, check out my blog post here. 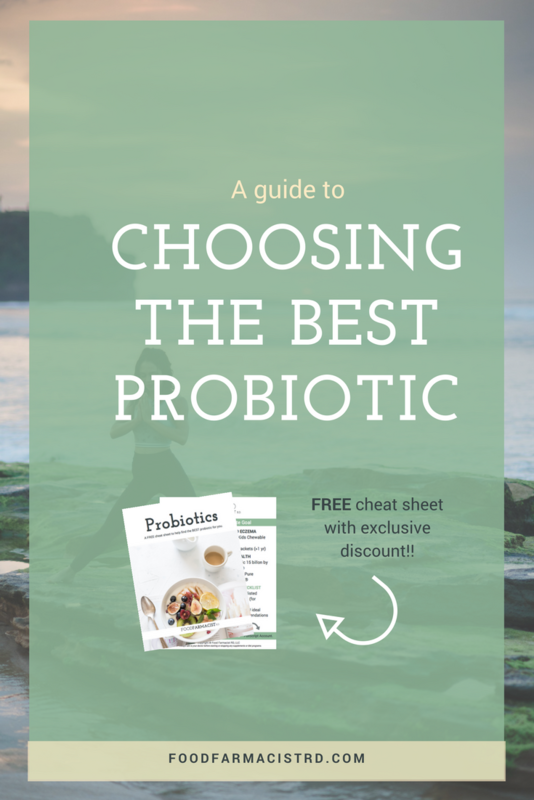 Download your FREE Probiotic Cheat Sheet for an extensive overview of brands, and access to an exclusive discount! Success! You're almost there - please check your email to confirm your subscription.